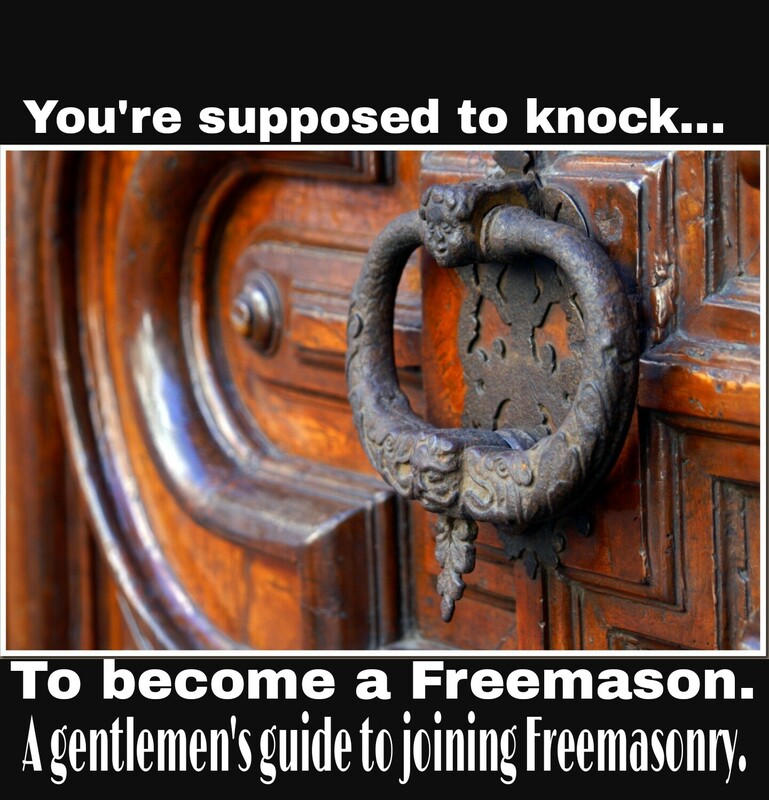 A gentlemen’s guide to joining Freemasonry. Good morning brethren. Today I got a early start on the day. Today I’m going to attempt to put into words why a man would want to join the fraternity. And why he wouldn’t. Based on 3 things. What he knows, what he sees, and what he experiences. This one will be lengthy. Let’s begin with what Freemasonry is said to be. Freemasonry is a beautiful moral system that’s illustrated by symbols and veiled in allegory. It’s a system of moral code. How it differs from religion or any other moral system: It truly doesn’t. Not from the outside. Once inside the fraternity, for me at least, everything about it is different. Freemasonry for me is a way of life. It’s a way of viewing the world from a tolerant perspective. That’s what it’s supposed to be. Sure, you’ll have the occasional experience that can affect your thoughts on the fraternity. But the important thing to consider is it’s a human institution. Much like religions. However, Freemasonry is not a religion. Humans have many errors and make many mistakes. Myself included. The fraternity is setup to inspire its members to live the life of a gentleman. So why would anyone join the fraternity at all? Let’s look at the 3 things that can influence why, or why not. Many people think its just a social club, or a civic organization that just meets to hang out. Or, even a community organization that donates time and money to their communities. All of this is absolutely true. But these reasons didn’t come until much later. Freemasonry is a place where all men can enter and be accepted for who they are. No matter your political views, religious specifics, race, creed, financial position in society… Or any other specific reason that may otherwise set you apart. That’s what Freemasonry is for me. And Thats what it has been since it began. Every institution has its fare share of sour apples. But the important thing to remember is that we’re all human. And it’s human nature to make mistakes. Freemasonry is about tolerance. To accept people for their flaws because we realize we have them as well. No one is perfect. What you witness by members of this fraternity is typically very personal and subjective to that one person. Whether it be a good experience, or a bad one. Freemasonry is a moral system. There can be men in this fraternity, much like others, who may not consider the betterment of the fraternity as a whole. And that’s one huge and important lesson of Freemasonry. Once you decide to join, if you decide. (we will never ask you, you have to ask us) You should be willing to always consider those who feel differently than you. Its okay to disagree. But a gentleman shouldn’t argue, be aggressive, or be demeaning towards others. This goes against the principals of our fraternity. Some practice these lessons better than others. Again, it’s a human run institution. So mistakes are bound to surface. That’s just life in general. When a man engages in conversation, over the course of any social engagement, opinions are typically formed about that person by the end of the discussion. How well has he carried himself, how well and respectful his interactions were, and how proper he chose to be during times of passionate debate. A gentleman, a true gentleman, will keep respectful no matter the topic. For me, personally, this has been the hardest one to manage. Not getting overly passionate about things that are said that make me angry. Anger is a natural human emotion. But the line is crossed when anger is then acted upon outside the mind and thought process by rude and discourteous behavior towards others. I personally feel Freemasonry has helped me more in this way than any other. Its given me patience, and fortitude to continue on and be respectful no matter what. Sure, I falter from time to time. But I’m human just like everyone else. Now for the message to my brethren specifically. We have all seen why a man wouldn’t join. We have seen it especially on social media and masonic Facebook pages. Those specific brothers who choose to carry themselves outside what it means to be a true gentleman and Freemason. What makes us different from the world of the uninitiated? Nothing. Not unless we take it upon ourselves to be true gentleman. Freemasonry has always been the meeting of the noble mindset. To come together and meet as gentlemen. And to represent the fraternity as the same. What example are we setting when we are derogatory or demeaning? We’re setting a very poor example for the young brethren coming in, as well as painting the fraternity negatively in a manner that is not represented within the fraternity. Tolerance isn’t about changing the opinions of others. Its about accepting them for who they are regardless of how you feel. To act upon our lessons and display a noble mindset. We are Freemasons. We are to be true gentleman when the world needs us most. We are to treat all men and women as our brothers and sisters. And with the same level of respect that we insist to receive in return. Be tolerant. Be patient. Word yourself in a manner that is truly respectful and considerate. And do so outside how you feel personally. Because we either represent the fraternity, or we don’t. The choice is truly yours. And if you choose to not represent the fraternity for what it is, why are we here at all? If we aren’t acting as gentlemen always, we won’t inspire men in good standing to join as gentlemen either. You have the ability to make the change yourself. And in doing so, others will do the same. Will the fraternity ever be perfect? No, that’s impossible. But that doesn’t mean we shouldn’t be trying to be perfect. Have a wonderful day brethren.